The WX wheeled excavators are designed to deliver a maximum of productivity and precision. The extra powerful hydraulics are managed by the CASE Intelligent Hydraulic System (CIHS) control, which offers a single CPU for improved controllability and simplified diagnostics. The CASE wheeled excavators use a 3-pump hydraulic system, with one pump dedicated to the slew function. This provides continuous movement and allows the operator to multi-function the controls for smooth, productive digging performance. 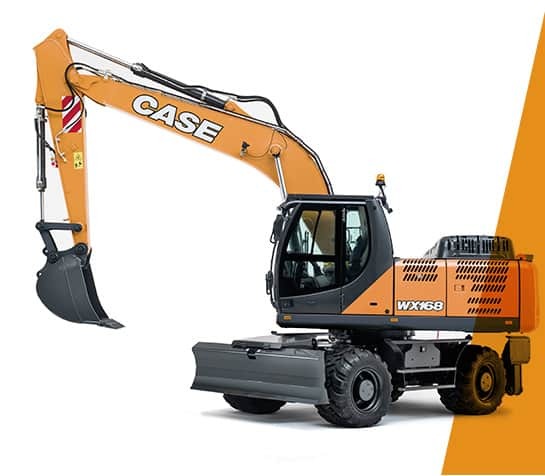 CASE wheel excavators are equipped with CASE Intelligent Swing system (CIS) allowing the operator to adjust the upperstructure slew speed to suit to all working site conditions. Two new working modes, easily switchable on the joystick, have been implemented to better adapt the machine behaviour to specific tasks: STANDARD MODE suited for general applications and precision grading with maximum fuel savings; POWER MODE for a maximised production and faster cycles. The Automatic Powerboost function delivers maximum performance for heavy breakout and lifting operations. The Power Limit Control feature monitors the engine and hydraulic pumps to optimise power output. The flow and pressure to the attachments is easy to adjust and up to 12 settings for different attachments can be memorised. The certified fuel efficient powerful engine meets Tier III emissions regulations granting reduced fuel consumption. A large fuel tank, combined with low consumption, results in not more than a 2-day work period between refi lls. The Extended Maintenance System grants longer greasing intervals on all pins compared to competition. All filters and regular fill points are grouped for easy access. Radiator and cooler cores are mounted side by side for more efficient cooling and easy access for cleaning. Optional high flow refueling pump with automatic cut off reduces downtime for regular fills. Our WX excavators drive through a fully automatic hydrostatic powershift transmission and heavy duty ZF axles, providing fast travel speed between working sites and excellent traction. An improved orbitrol steering system delivers effortless and precise control. A larger steering angle makes it even easier to move in confi ned areas. With a creep speed function and high ground clearance, the machines are also capable of tackling the toughest of site conditions. Excellent drawbar pull is a feature of all three machines and the axles have an auto-locking feature for maximum stability when working without stabilisers. Multi-disc wet brakes and axle oil change intervals of 2,000 hours will reduce your customers’ ownership and operating costs. The new WX design leads to an outstanding stability even on tires only. Our wheeled excavators have always boasted a robust design and sturdy build quality. These new WX models are no exception, with a strong chassis providing the option of a dozer blade, the dozer blade and stabilisers, or stabilisers front and rear for total balance and a stable working platform. The dozer blade with parallel kinematics is made extra-robust in curved design for best material retention. Big and wide-opening hoods provide easy access to all service points. Maintenance operations are quick and easy with the grouped, easily accessible greasing points, and easy to reach filters at the rear of the machine. The extended greasing intervals for the attachment (up to 500 hours) maximise uptime and lower operating costs. The side-by-side radiator layout results in an extremely reliable cooling performance and makes it easier to clean them. A front net keeps dust away from the radiators, lengthening the interval between cleanings. Boom cylinders feature safety valves as standard. For added safety, a complete object handling kit (safety valves on dipper, loading hook, overload warning) and a heavy-duty holder for grabs are available as options. The reinforced structure of the cab is ROPS and FOPS certified. The inclination of the steering column is continuously adjustable to fi t the operator’s best working position; the controls are individually adjustable to match their preferences; the adjustable air suspended and heated seat combined with the ergonomic design of armrests and foot pedals provide the best possible workstation.The tinted safety glass, sun blinds and transparent rain protection above the front window provide comfortable working conditions, while the automatic air conditioning maintains a comfortable in-cab climate for more productive work. A hot and cool box, plenty of storage compartments, a radio with USB support, a microphone for handsfree conversation, a front aux. port and a 12V auxiliary socket complete the operator’s comfortable workstation. The controls layout is designed to minimise fatigue, with all travel functions and switches easily accessible and grouped on the steering column. The machine’s information is easy to access and understand on the in-cab monitor, so the operator can focus on the job. A new engine speed and working mode selection dial makes it easy for the operator to set the machine up in any working situation. The dial delivers low idle speed, two lifting modes, and three Eco working modes. It also provides access to the Heavy Mode for maximum digging performance. The new levelling mode can be easily activated in Eco or Heavy mode by simply pressing a switch on the right hand joystick. The blade and each of the stabilizers are proportionally operated. Each of the stabilizers can be easily activated by switches. Large glazed surfaces, safety tinted glass, onepiece right-hand side window and large roof window provide superior visibility all around. Standard working lights on the boom and cab front add to the excellent visibility. The standard rear view camera further enhances visibility to the rear.